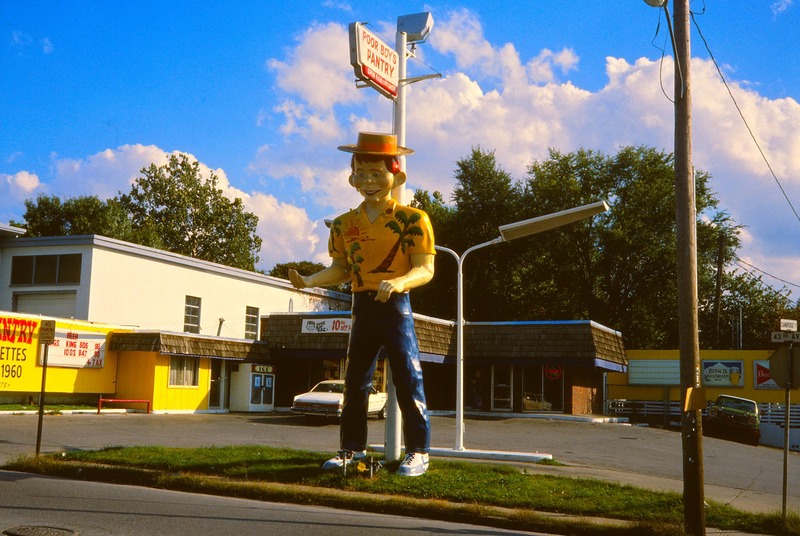 When roadsideamerica.com started posting about their muffler man sightings and enlisting the publics help to find more, one of the early reports that came in was of a half wit that had stood in Kansas City, KS. From the reports given in seemed that it has disappeared sometime in 1996 after falling over in a storm or possibly was moved during road construction. I was never able to find anything else about it and often wondered if there was really ever a half wit there at all. Well in Sept Scott Phillips settled all those questions when he posted a picture on his blog of the Kansas City Half Wit that he snapped in 1985. From the picture we can see that he stood in front of a place called “Poor Boy’s Pantry” and from the records I was able to dig up this name is still registered and has been since 1960. Today nothing is left of the half wit except the same pole he stood against in 1985. The building is still there although now a sign above the door describes it as ” The Cabana Tanning Co”. After looking at Scotts picture I recognized the shirt as the same one the half wit in Flint, MI wears. I have heard reports that the Kansas City half wit’s Hawaiian shirt was painted on sometime in the early 80’s, this makes sense because I have seen a advertising photo from International Fiberglass showing the Kansas City Half wit around 1969 and he is still wearing factory colors at that time. So I think it’s pretty safe to say that this guy is now in Flint, MI. 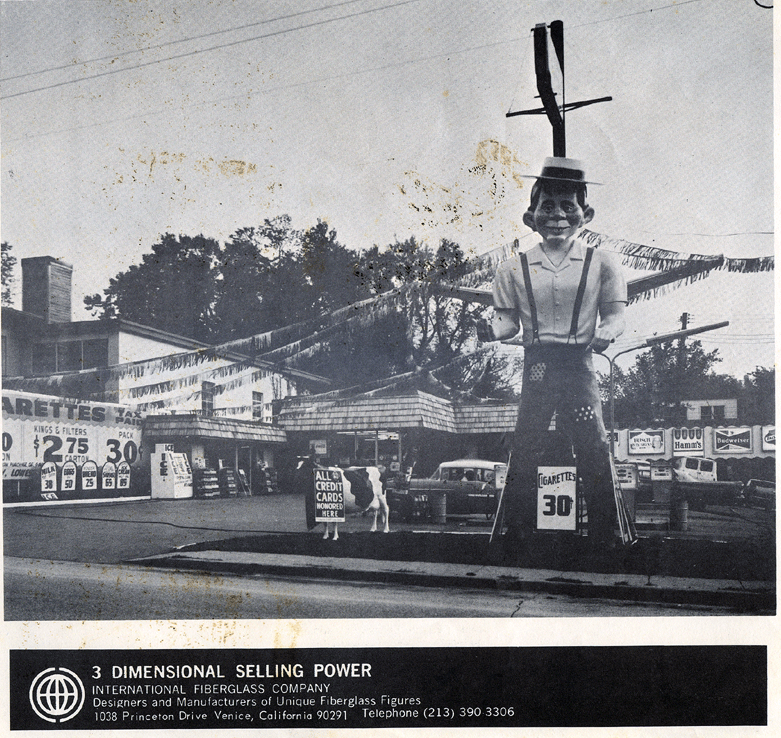 We know that Bob Perani bought the Flint M Man sometime in the late 90’s and that he stands outside his business the Dort Mall. Sadly Bob passed away in the summer of 2012 and no one else seems to know where exactly Bob got him. I think it’s safe to assume that Hawaiian shirt says it all. Thanks Scott for shedding some light on a long lost m man! 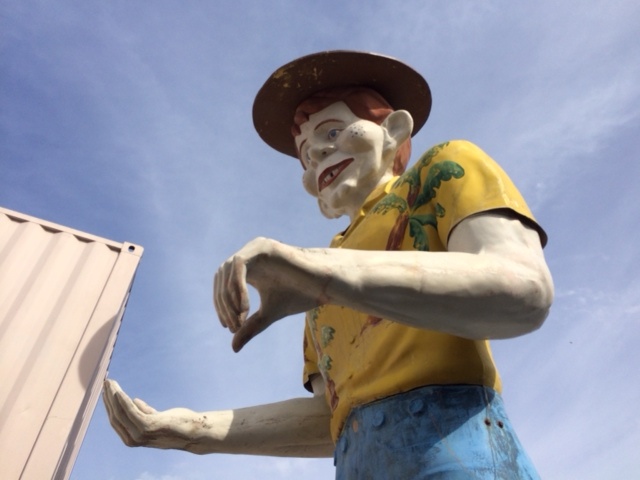 UPDATE: In January 2014 the giant was sold to Bruce Kennedy of Hayward, CA and the Half Wit will soon join the 3 other Muffler Men of Bell Plastics. Special thanks to Debra Jane Seltzer and her website Roadside Architecture for letting me post her picture of the Half wit in Flint. Also thanks to Scott Phillips for the use of his picture.